Another in our ongoing series of reviews of cigars given to us by the good folks at J&J Cigars. 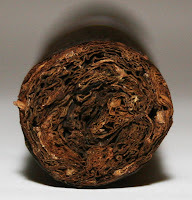 Featured this time is the Toraño Exodus 1959 50 Years Robusto. 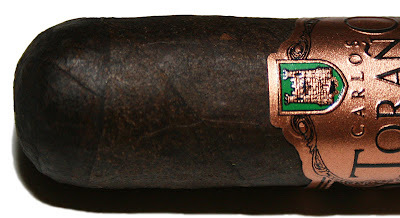 Produced at the STG factory in Estelí, it features the new copper colored band and a dark, rich, and somewhat rough-looking Brazilian wrapper. The current Cigar Insider rating for it is 88 (Oct, 2009). Three of us took part in this review; club co-founders Robert & Fernand and club member Tom. As is our usual method, we followed Cigar Aficionado's 4-part rating system (Appearance & Construction, Flavor, Smoking Characteristics, and Overall Impression). First appearance, with the new copper band, is very pleasing. The dark color and toothy texture of the Brazilian wrapper is enticing. Roll quality appeared pretty good, but unfortunately, one of our sample drew too fast while another was too tight (though it did improve for a brief period through middle portion of the stick). The success of burn seemed to coincide perfectly with the degree of draw. The fast cigar burned great and the tight cigar didn’t burn well. The quantity of smoke produced fell along those same lines as well. The ash was of a light-grey color and very stable; actually needing to be ‘broken off’ at times. The Toraño 50 Year was milder than we expected, at the start. The flavor improved over time; started creamy and cool. We categorize it as mild-to-medium for the first half. There were nice coffee-woody notes along the way. Later it became stronger up to the end, where Robert found that a black cherry sweetness really kicked in. Tom & Fernand, on the other hand, found their samples finishing instead with a cedar-like sweetness. Our averaged rating for the Toraño Exodus 1959 50 Years Robusto is 85. All in all, a very good cigar. One of our tasters felt that got better as it smoked. None of us found it hot or harsh and it had nice flavor transitions. We all agreed it’s worth going back for more. Thanks again to John at J&J Cigars for giving us the opportunity to enjoy and review this fine cigar.